Thanks to the ingenuity of the instrumental legislation in the Taxpayer Relief Act of 1997, there is no longer any regulation against holding gold within a self directed IRA retirement account. There are some restrictions still, but despite the rules, it is now a fact that SIMPLE IRAs, SEPs, and IRAs can all engage in gold investments. Sadly, no dependable statistics exist which tabulate the aggregate numbers of such IRAs which have pursued gold investments since the 1997 act passed and changed the gold retirement investing climate. Similarly, today there is not any statistical data released that shows what percentage of all IRA funds and assets are held in gold. Despite the lack of clear data on what other IRA retirement investors are doing concerning gold in their retirement portfolios and strategies, there is sufficient statistical information to show the effects on a portfolio of including different amounts of gold within it. This page examines the cases of five percent, 10 percent, and 25 percent gold allocations of IRA assets. The study you will read the results of in the various places on this page looked at three differing baseline portfolios. These were Conservative, Moderate, and Aggressive investor portfolios and profiles. Gold in three separate allocation amounts was also considered, studied, and back tested to the years 1972 to 2015. These amounts were five percent, 10 percent, and 25 percent gold allocations for IRA assets and funds. Figure one demonstrates the composition of the Conservative, Moderate, and Aggressive profiles and portfolios. As you can clearly see, the baseline Conservative portfolio holds only 10 percent of applicable assets in American Stocks, with 80 percent held in U.S. 10 Year Treasuries, and the remaining 10 percent kept in Money Market Funds good as Cash. Meanwhile, the baseline Moderate portfolio is comprised of 35 percent American Stocks, 60 percent American 10 Year Treasuries, and only five percent Money Market Funds as Cash. Finally, the Aggressive portfolio contains 95 percent American Stocks and five percent in Money Market Funds same as Cash. There are no Bonds in the aggressive portfolio by deliberate design. It is important to understand that between the study years of 1972 and 2015, the growth rates for these baseline portfolios would have been Conservative at +7.38%, Moderate at +8.53%, and Aggressive at +9.97% annually on average. This translates to a million dollar starting investment for each of the three portfolios increasing to $22,960,826 for the Conservative, $36,713,972 for the Moderate, and $65,602,070 for the Aggressive portfolios. 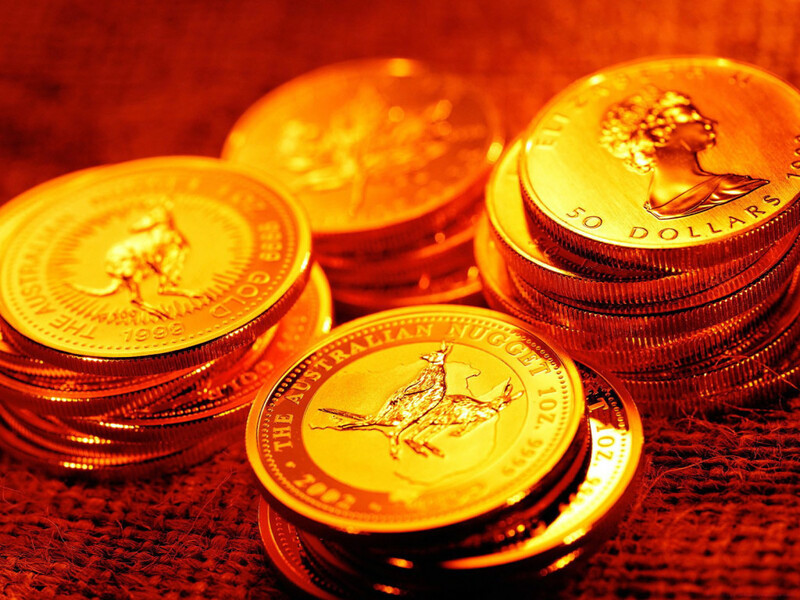 The appropriate amount of gold in a portfolio depends on which profile the investor fits into. The three choices more or less are conservative, moderate, or aggressive investor and risk tolerance as this study and its results reveal. A conservative investor might want more gold to hedge his other investments, hence the 25 percent allocation described below. A moderate investor would want a medium amount of gold protection, so we give these investors the 10 percent gold allocation below. Finally, an aggressive investor wants maximum exposure to equities and so will take a lower exposure to gold of only five percent in consequence. Let's look below to see how each of these portfolios fared on average over the 43 years as well as during the worst and best performing five stock market years throughout this same period. As you can see, during this modern era investment period through 2015, the Aggressive portfolio which included five percent gold increased its total return from 9.97 percent to 10.11 percent. This is not an astronomical increase, granted, but it represents a gain without an increase in risk, and with a superior level of asset diversification into three asset classes instead of only two. Had the Aggressive investor increased his or her gold exposure to 10 percent or 25 percent, the overall return would have grown to 10.21 percent or 10.31 percent, respectively. The losses were decreased in every year by the inclusion of gold. This was more the case for those Aggressive investors who chose to include a larger amount of gold such as 10 percent or 25 percent in their overall asset allocation for the portfolio. This clearly demonstrates that the more gold which was included in the best stock market performance years, the lower the aggregate returns would have been. The reason for this is that in the best stock market years, it benefitted investors most to be heavily invested in stocks. Gold performs differently than stocks especially, and since it provides no yield, it can not compete with the best performing stock market years. This is why the Aggressive investor would have ultimately chosen to only include a five percent asset allocation to gold, since by very definition, an Aggressive investors wants as much exposure to volatile stocks as possible. Once again, the Moderate portfolio is improved slightly from 8.53 percent baseline performance to 8.75 percent return when it includes 10 percent gold allocation. It would have been even better with a larger 25 percent gold allocation. Here it becomes clear that a 10 percent gold inclusion to this Moderate portfolio made an important difference in performance during the worst performing five stock market years. In three of the five years, negative or near flat returns without gold became flat or positive with 10 percent gold inclusion. As you might expect from our previous examination of the Aggressive portfolio, including gold in the best stock market years reduced overall returns somewhat, except for in the second year demonstrated where it slightly improved the overall performance. The inclusion of 25 percent gold to the conservative portfolio has improved the overall results from 7.38 percent to 7.99 percent, a significant two-thirds of a percentage point per year on average for the Conservative portfolio. In three of the five years shown, this has somewhat improved aggregate returns. Note that this portfolio again has minor exposure to the stock market and major exposure to inversely moving bond markets, so its returns were positive in four out of the five years even without the additional diversification to gold as an asset class. As anticipated, in four of the five years shows, the inclusion of 25 percent gold (or any gold for that matter) decreases the returns for the best performing stock market years. This is again simply explained by reminding you that in those best five stock market years, it was difficult for any other asset class (and not only gold) to compete with stocks in the United States.